Future Technology Devices International (FTDI), available through Glyn High-Tech Distribution , have released a USB-Key security device. 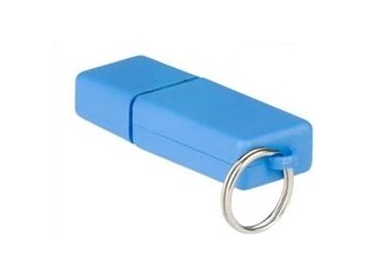 Using a unique, hard-coded identification number, the device can interface to any USB host or hub to provide application software access control (security dongle) or as part of a more sophisticated key-based physical access control. During manufacture, the USB-Key has a unique FTDIChip-ID number burnt into it. This number is only readable over the USB interface, making it suitable for PC or embedded security developments. The USB-Key, compatible with USB 1.1 and USB 2.0 specifications, derives its power from the USB interface and does not require any external supply or battery. In addition to providing a unique identification number, a user writeable EEPROM area is available to allow further encryption techniques. Examples include reading the FTDIChip-ID, further encrypting it and writing it back to the EEPROM. By using this approach, industry standard encryption techniques such as DES, AES or Blowfish could be implemented. Also available is an ActiveX control, SafeGuard-IT, which can utilise the FTDI-ChipID feature of the USB-Key to provide asymmetric public and private key encryption. Encrypted information based on the FTDIChip-ID, the private key and an optional password can be programmed back into the USB-Key’s integrated EEPROM. This provides an easy to deploy method of software protection with a high level of security. With this approach, the SafeGuard-IT protected software packages need only be compiled once and can then be distributed with just two additional files to decrypt the information, the public key and the SafeGuard-IT DLL.